• The company has achieved about 24% export volume in volume terms. On a 9m basis, the export volume has increased to 18%. • Due to demonetization, regular activities in textile sector were impacted. Further, the final transactions with end customers were through cash, which were again hampered. • PTA is sourced from Reliance and Indian Oil. Further, the raw material is even imported to balance out the remaining. Proportion of domestic and import in PTA is about 80 to 85% local and the remaining imports. • MEG is sourced from IOC, which is the only source in India and the balance is imported from Middle East. Moreover, proportion of domestic and import in MEG is around 25 to 20% in local and balance imports. • There wasn’t much price increases in the finished product (to pass on the raw material price increase) as the performance of November was not up to the mark. However, from December onwards the company has been able to pass on the price increase in the raw material – in January it was fully passed on. • In November, the stock levels were up. The group was able to sell what was produced in December but the extra inventory (from November month) was carried over. • About 15 to 20% of production levels were cut across the product chain & gradually it was increased to full level. • There has been working capital increase in this quarter. Also, before this in the expansion phase, the interests were being capitalized, which has come into this quarter. • The group has contracts with most of the suppliers – based on international pricing published by ICIS and Platts, which is a formula, based pricing. The formula and the discount get negotiated once every year. • The company has different term loans with an average of 7 years of repayment. About 1 year of a moratorium and 7 years repayment. 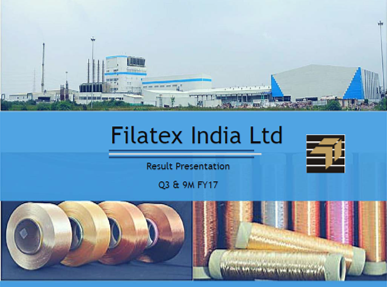 • When compared to its peer Sumit Industries, Filatex’s margins are 8% (Sumit – 9 – 10%) mainly due to chips, which adds to the topline but doesn’t provide the much-needed boost to the margins. • Total production in Q3 FY 17 was about 51,000 tonnes and the sale was 48,400 tonnes. The total stock was about 2600. • Currently, the company has enough internal accruals in place to take care of the expansion part. • Expansion of the textured yarn qualifies as TUFF from centre as well as the state. The company has already filed applications with the centre and is expected in this quarter. This amount will be about INR 85 lakhs for the Q3. • Further, a similar amount is expected from the centre in Q4. On the other hand, the state subsidies will be quite less about INR 40 lakhs per quarter. Both the state as well as centre subsidies are expected to continue for a period of 5 years on a reducing balance. • The new capex that the company plans will not be coming under any subsidy program. However, there is a new provision launched by the Gujrat government where the company can claim VAT or state GST as a refund of 70% of the total amount paid in 10 years (maximum limit of 7% per year). • Post the expansion phase, the company expects to generate revenues in the range of INR 2,500 to INR 2,600 crores. This is at the current level of raw material prices, which plays a key role in the top line. • New investment is expected to be in the range of INR 343 crores, out of which INR 210 crores over a period of 10 years will come under the subsidy over the ten year period (70% for 10 years). • Filatex is doubling the count of thread lines. In Dahej plant, the company plans to add extra 4900 thread lines in the new expansion.